I’ve heard beautiful things about The Table and wanted to eat there for ages. “Yes, let’s book and all go sometime.” How often have you said that to friends? Yet somehow other commitments and schedules get in the way. Nearly a year ago my husband and I sat next to the lovely Jessica and Luke Grant at a Cape Town pop up restaurant by chance, sharing an evening of communal admiration of some visiting chefs’ tasty plates in the way that food lovers so easily can. 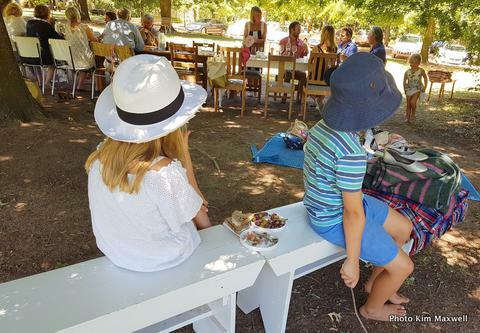 So I was especially delighted (and excited) to be invited to bring the family and join a small group gathered for a special birthday party at this rural Stellenbosch farm restaurant. I do love a lazy Sunday lunch. The average Stellenbosch wine farm is slick and polished. De Meye, in contrast, is a small family owned winery. It is rustic and scattered with things that appear a little wonky or run-down. It’s at this charming venue where the small restaurant operates. The simple dining concept is all about provenance. 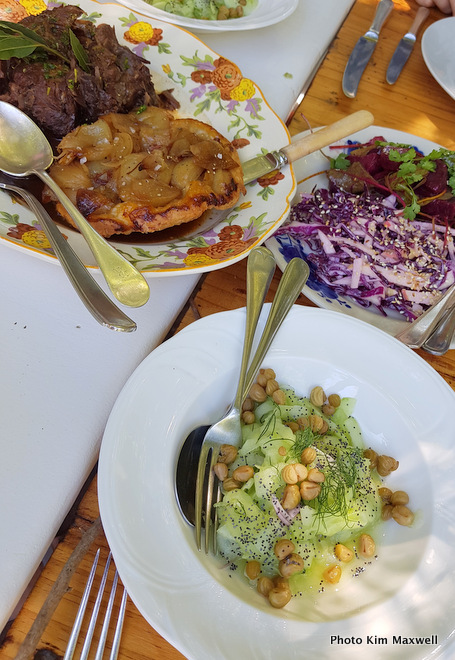 Beautiful lunches are created by Jessica, using produce grown and gathered in their kitchen garden, in addition to quality ingredients sourced from neighbouring regions. Luke gives the table guests a rundown of where and what at every course, with olives from here and heirloom tomatoes from there, as well as pasture-reared meat to farm eggs. This mystery menu meal is always three courses and the style is comfort country fare, a help-yourself deal served on mismatched platters. As their website states quite charmingly, in summer tables are spread out on the lawn, a tree apiece to give guests a sense of dining privately in some vast garden. I don’t remember all the specifics. 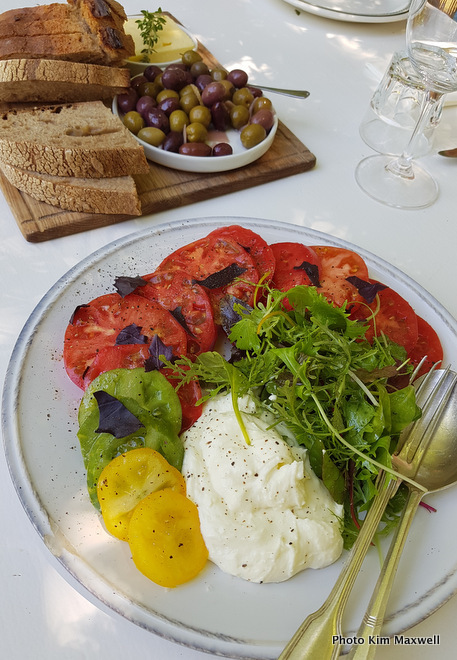 But we started with farm butter and artisanal sourdough from De Oude Bank Bakkerij, Chrisna’s assorted garlicky olives, dipped into soft ricotta mixed through with goat’s cheese, and fat, juicy red and green heirloom tomato slices. Glasses were topped with chilled Rosé. 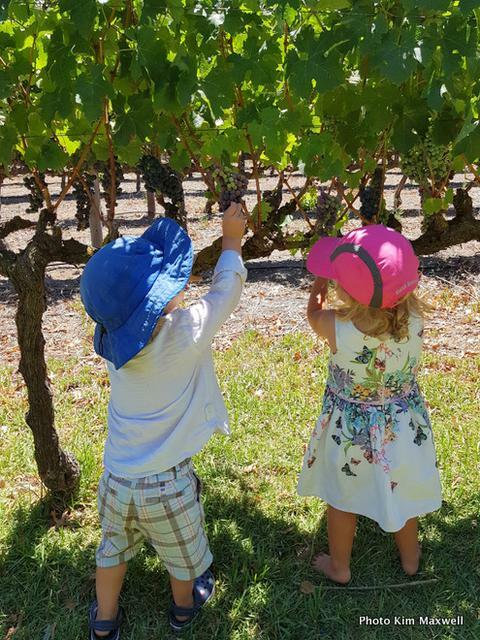 Our children were kept amused by lots of grass and space to run, visits to nearby vines to sample ripening grapes, and a dog called Lulu that had an obsession with digging. Main courses brought Ryan Boon’s beef shin cooked to velvet softness, a great partner with a slice of onion tarte tatin. Heirloom beet salad was fun, alongside a coleslaw with apple, cabbage and I think, tahini dressing. Fresh and unusual, a lightly pickled cucumber salad with nasturtium capers was something novel. 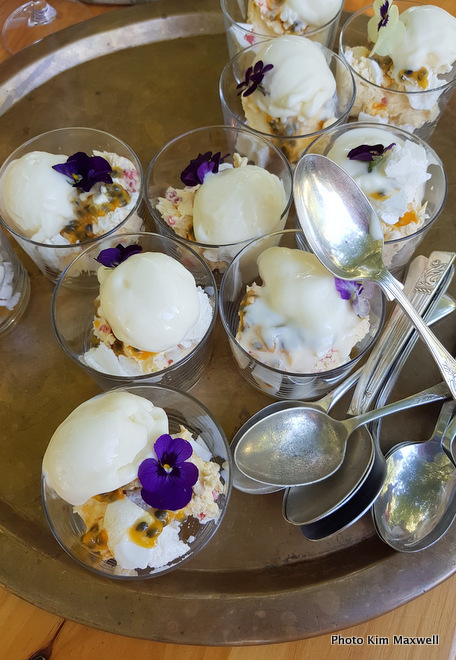 Dessert was sugar cones for kids, with adults tucking into bowls of passion fruit tangy-creamy frozen yoghurt, and cream whipped stiff with lovely edible things on chewy meringue. I like coffee strong and not overly milky: what a delight to have a flat white served exactly as requested. Staff are well trained here. Go to The Table to enjoy a delicious country experience under a shady tree. This is honest, no-frills food created with positive energy and good intent. 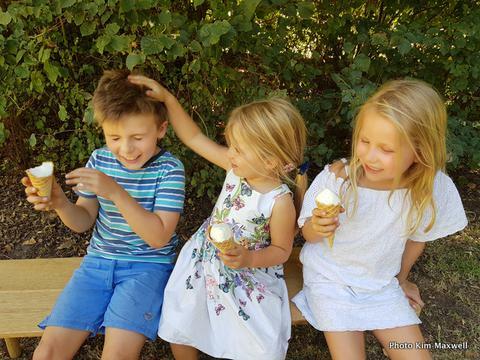 And if you have children along, they will leave grubby and happy.